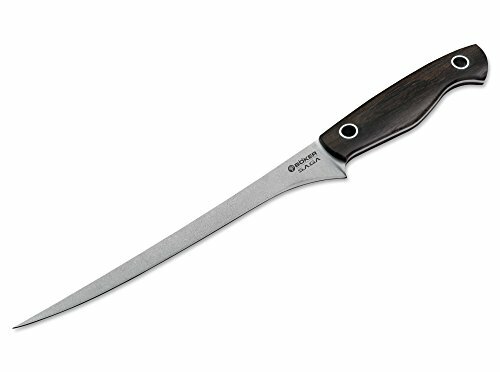 The Boker 130382 Saga Fillet Knife has an extremely durable 440C stainless steel stonewashed blade with superior edge retention and ergonomically curved handle made of black G-10. The Saga series is setting a new standard in cutting! The slightly curved rolling handles are indestructible and resistant to temperatures and humidity. The design of the handle provides absolute control of knife and an outstanding cutting experience. A flat grind is used along with the 440C stainless steel which offers edge holding capabilities and corrosion resistance. The stonewash finish on the knife provides extreme resistance against scratches, with the micro structure of the finish. This special grinding method also upgrades the existing cutting performance. A special focus is set by the large hollow rivets, which are unmistakably the signature of Mr. Jesper Voxnaes. Each knife comes packaged in a premium gift box with a certificate of authenticity. Blade length: 7 3/4 in. Overall length: 12 1/4 in. Weight: 3.7 oz. Limited Lifetime Warranty. A chestnut tree is the world famous trademark of the Boker knife manufactory in Solingen, Germany. It represents innovative, high quality, exceptional knives, manufactured with pride, by hand, for over 145 years. If you have any questions about this product by Böker, contact us by completing and submitting the form below. If you are looking for a specif part number, please include it with your message.